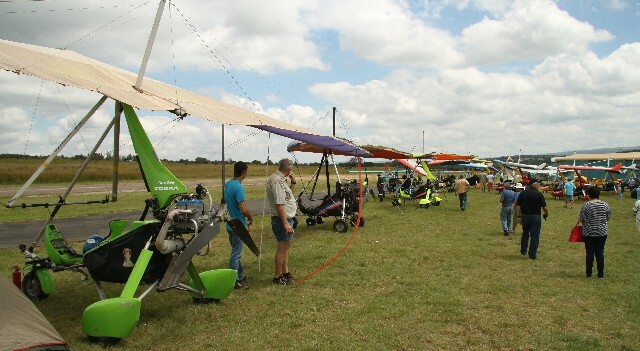 First held at Tedderfield in 2012 the MISASA (Microlight Association of South Africa) Shoot-Out was not only a huge success but an innovative event that brought most of the sections of the Aero Club together at one venue. In 2013 it was again held at Tedderfield and it was even more popular than the year before and became the event not to be missed. 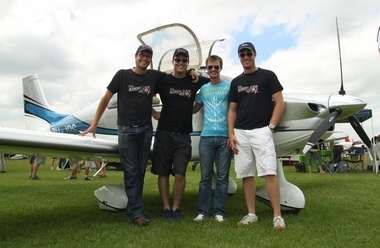 Because of certain regulatory requirements and other reasons the organisers were forced to move the event to Kitty Hawk Airfield and rebranded it as the MISASA Fly In. There were doomsayers who predicted that as a fly in it would not succeed but fortunately they were wrong. It was by a long shot not your usual fly in. Almost 40 exhibitors were accommodated on the neatly cut lawn between the clubhouse and the flight line and their stalls were all busy. More than 130 aircraft mostly NTC (Non Type Certified) types visited or where displayed by the various manufacturers and agents. Visitors were treated to types ranging from the futuristic…………………….. Regulations unfortunately forbid demonstration and display flights at fly ins. Fortunately this does not apply to Skydiving and Graham Field and Mike Rumble had a ball on the day with a number of display jumps including a formation sky dive. A Missing Man Formation was flown in memory of the Aviators that were so tragically lost in four accidents during the last three weeks. 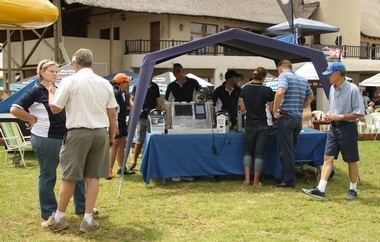 The MISASA Fly In was, as we have been getting used to, a well organised, well run and very hospitable event. The catering was good with sufficient refreshment to suit all tastes. Parking for aircraft was well controlled by the 9th Irene Air Scouts all of whom were entered into a Lucky Dip Draw with three of them winning a flip sponsored by Rhino Park based LSA (Light Sport Aviation). Labouring in the hot sun to make everyone's visit safe and pleasant were a team of marshals' as well as MISASA committee members and other volunteers. 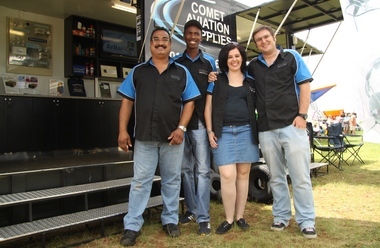 Some of those often forgotten people that make things happen. 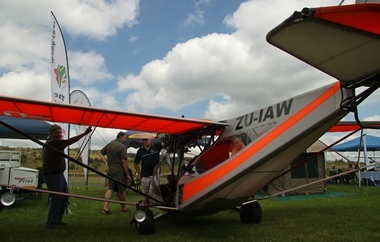 The MISASA Kitty Hawk fly-in 8th Feburary 2014 was a fantastic grass roots flying event. Members from many of the AeroClub disciplines were present; Microlighters, Balloons, Parachuting, Experimental Aircraft Association, Gyros & Sport Aerobatics with a wide array of their "toys". Kitty Hawk Aerodrome is a really great location for this type of event with a taxiway parrallel to runway 01/19 making vacating the runway to marshalled parking a pleasure. The Air Scouts were the willing runners guiding the planes to parking positions. It is great to see MISASA encouraging their involvment in this type of grassroots aviation. Well done Gentlemen! Fixed wing aircraft were parked to the south of the club house & the trikes made their home to the north of the club house. It is great to witness the enthusiasm of the trike pilots. Helicopters were parked at the main windsock at the threshold of runway 19. Aviation vendors were accomodated on the lush lawns in front of the Kitty Hawk club house. Books, models, badges, propellors, fuel testers, magazines, aero estates, headsets, GPS & aircraft of all descriptions were on sale. Food was freshly prepared & refreshments were cold. Ample chairs & tables were available in the marquee on the lawn & the verandah of the club house. The weather was a concern in the early morning with mist at Petiet & Babsfontein but it cleared by early morning allowing trikes, gyros, helicopters, Jabbies, Savanahs, Cessnas, a Chippie & a Stampe, among others to fly in safely. Well done MISASA, Kitty Hawk Aerodrome, vendors & pilots for making it a safe day in the sun with continuous flying taking place. I look forward to the 2015 event. MISASA can rightfully be proud. In my humble opinion the Fly In was a huge success that will, like the Shoot Out, become a "not to be missed" event.